Published by Cyril Huze November 4th, 2011	in Builders, Editorial and Events. Lehman Trikes Inc., calling itself the “Leader Of The Three World” and specializing in trikes, trike kits and conversions, issued a press release to investors signed by its President Kennon D. Hines, in which the company announces that it is looking for strategies to enhance shareholder value. Options include the possibility of selling, a strategic business merger with cost saving initiatives. Lehman Trikes Inc. stock (OTC Symbol LTRKF) lost 97.55% of its value in 5 years and 54.77% during the last 12 month. Market capitalization (shares x price of share) seems to be under $500,000. The company was originally founded and established in 1985 by John Lehman in a rural community of Alberta, Canada. Using his garage as a workshop, and a 1981 Honda CB900 as a donor nike, he had successfully achieved his goal, to build a very comfortable 3-wheeler. Progressively Lehman Trikes achieved recognition throughout the motorcycle community for innovation, leadership, and advancement of three-wheel motorcycles. Now based in Spearfish, South Dakota, Lehman has grown to become a publicly traded company. After the jump, I publish in full the Lehman press release addressed to investors. Lehman Trikes looks for strategies to enhance shareholder value. the sale of the company, or a strategic business merger. business under a reduced scope of operations. quality and reliable products. There is no assurance that any transaction will be completed. Go back as a private company. Limit your number of models to a minimum. Save money everywhere you can. Or Kaput! A shame, John & Linda are two of the nicer people you’d ever want to meet. Sometimes smaller is better. It’s hard to serve both shareholders and customers, ask any Harley customer. Merge with the Alsops….Then you can all go broke together !!!! the trade and dropped them like a used sorority girl…. Sounds like an opportunity for Victory…. An opportunity for Victory…and for Harley to get everything Lehman for almost zero. No private group/investors is going to infuse Lehman with cash. It’s not gonna happen. Sad, but I think it’s already over. RIP Lehman. It never ceases to amaze me that almost every company that gets in bed with HD usually end up at the bottom of the pile when the Motor Co is finished with them …… what was that old song by Deep Purple/Richie Blackmore – “Mistreated” that says, in part …” I’ve been mistreated, I’ve been abused. 666, people like you need to stay off this blog, or any other blog that supports this industry. Lehman has been a part of this industry for a long time. You are bashing on an American company that employs American people. It’s people like you that are hindering this industry, not supporting. I hate to see an American company go by the wayside. Lets hope it doesn’t happen! Sad to see. It’s a reflection on our industry as a whole people. Between over legislation and an economy that’s in the dumper and has been for years and will be for years to come from what I see, it’s tough for almost anyone in this industry to survive. Markets do shift and customer bases are shifting too. Versatile, multi task, decently priced motorcycles seem to be the way to go or at least that’s our focus. I hate to see any American business go under. Reminds me of an old Halrey shirt that used to say “Buy American, the job you save may be your own.” And I’m not shocked to see HD used them and then dumped on them. Seems to be the HD way. 666 – your comment re the Alsops is not only mean spirited but wrong. Kevin and Mona Alsop, although facing tough times in a market that has seen many manufacturers close shop, are still in business and very likely to remain so. Sales in various overseas countries are growing and are especially good in Australia where the local importer of Big Bear Choppers, Wild Card Customs, is having trouble keeping up the build rate to satisfy a fairly long waiting list of customers. That’s a fact. John and Linda, try to hang in there for one more year or so, as soon as the Presidential elections are over, everything will change around. Hang on for one more year, that’s all you have to do, there will be a boom, like you won’t believe after that. You did a good job, hold on. It is truly a shame to see such a 1st class, world leader, very professional and highly respected company in this condition. It is also despicable that Harley would do what they did to a fellow American company especially after allying themselves with Lehman. All for Harley’s self gain in the end which appears was their goal from the get go. We Americans are competing with low cost overseas countries yet some American companies prefer to stab some fellow Americans in the heart after giving them the golden keys of how to manufacture that product. Not trying to be mean to anyone..This portion of the business/industry is about over.It was fueled by the rising values of homes and people using the real estate as a cash machine..That too is long finished.Take what money you have left and hold on to it. You made some so try and keep what is left. Just curious as what HD did to Lehman? I must be out in the dark about this. I know they were using Lehman kits for their factory built trikes but have to be brought up to date as to what happened?? Always sad to see good people and good companies struggle. Lehman Trikes build a quality product and have exceptional customer service values. Wishing only the best for Ken and his team. I met the Owners in Daytona about ^ years ago and they were a Class outfit and so were their People. I know that if you can create a need for 50 Billion, then you can get it from Obama. He won’t give any loans for less than that! Sorry HD and Obama bashers, but Lehman was in decline BEFORE the TriGlide deal and the country had a Republican administration. The Harley investment likely saved the Lehman corporate life at the time. HD had the TriGlide on the drawing boards for a long time and the joint venture allowed them to move forward sooner, since Lehman had unused capacity to make the trikes. It is entirely possible (and in fact, probable) that the joint venture deal was agreed in advance, to transfer future production to Harley facilities. Not to be lost in all of this is all the various problems with the trikes built under the venture. While most were the result of moving to a Harley engineered design, some of that may have also been caused by Lehman simultaneously, attempting to ramp up a relationship with Victory. The fact is that if HD had not made the investment in Lehman, there may well not have been a company to put up for sale today. Dave. You are absolutely right. Lehman was in trouble since a long time. The stock value starting to decline 5 years ago as the chart published by Cyril clearly shows. Harley helped Lehman survive, not their main purpose. People may have a positive view of the Lehman brand, but I am sorry to say that it’s another brand in the motorcycle industry unable to understand what’s going on in the world, unable to adjust, to re-structure and to redefine its products. Most people in the industry have ideas, but no clues about business, management and marketing. There is room for a trike manufacturer, just a small niche market. Baggers and trikes are not potential growth markets. Quite the opposite. I bet that in 3 to 5 years, bagger sales are going to begin to slow down. It’s a market of transition giving some extra time to manufacturers to conqueer new targets (youth) and new markets (India, South America) Lehman should have done pretty good during 3 to 5 more years. They didn’t. Their fault. Met with Cyril in Spearfish 2 years ago during Sturgis. We were talking very close to the Lehman factory. He told me that he was certain they would go down in the next couple of years. He explained to me why he thought so. Enthusiasts with no funding, no clue about business and I remember him telling me, no intelligent marketing. Same reasons than what Mark just explained above in his comment. Amen. Yep, the boom was created by borrowing on home mortgages and those times are gone. All that is left is the debt and the slow pain of paying it off. It will take a few more years for everyone to catch up with their upside down situations. Meanwhile companies selling bikes and boats need to find new markets like China. Even a ten year old Harley will sell for 35K in a week in Shanghai. Cash flow is king. Not sure if investment would help. Someone here said Victory would be a good match. Victory does have free cash flow and is aquiring companies at a rate of two per month. Victory just invested in an Oregon company that makes electric bikes. That same company is booming from sales of police bikes to Hong Kong. This selling of US make electric bikes in Hong Kong says there is a market, you just have to find it. I looked at Lehman for a trike when I first started looking when my health was affected with balance issues. I went as far as almost buying a VW pan and transmission to build a homemade trike. When Harley Davidson came out with there trike in 2009, I started looking very seriously at there new design. In 2010, I purchased a Tri-glide and could not be more pleased. 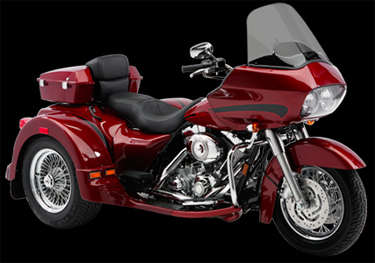 If you look at the drop in Lehman sales, it coincides with the release of the Harley Davidsons new trikes. I had a dear friend that died on the highway because of his conversion kit, so I don’t put much stock in conversions design or safety.